Twenty-eight years ago one of the turkeys on our, then, very small farm got a reprieve. That isn’t going to happen this month for the 47 who, from their tiny poult days in the warm brooder, developed into full-grown somewhat elegant (for a turkey) birds. 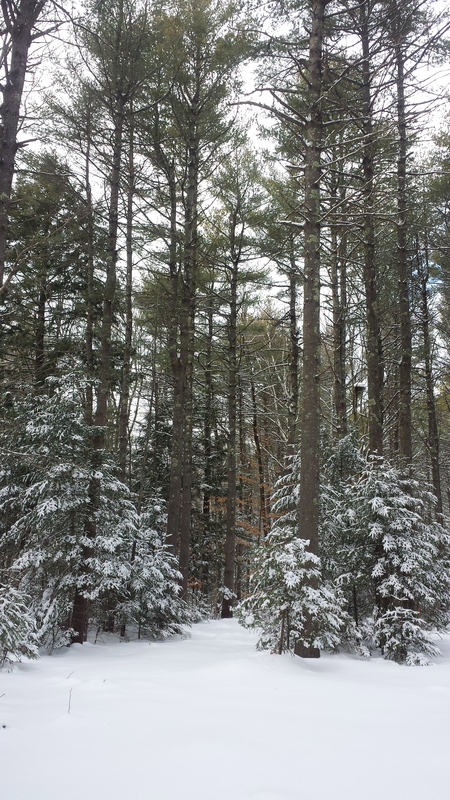 They have even weathered that unseasonably early snowstorm, a bit like their wild cousins. But, now it is time for eating them. The farm isn’t Pete’s and mine anymore either. It is now a thriving, serious organic business that belongs to Jake and Abby. But, I still get to do the chores once in a while. I can’t help, however, thinking back to an essay I wrote 28 years ago, one about AT, our turkey who survived Thanksgiving by ingratiating himself into my heart. Things have changed—most noteably the cost of buying a poult (now $7.08) and feeding a growing turkey ($28.00 per turkey). The 47 turkeys Jake and Abby are now raising have had, like AT, a fine life. They live in a large, rotating pasture area, so grass is always green and fresh. 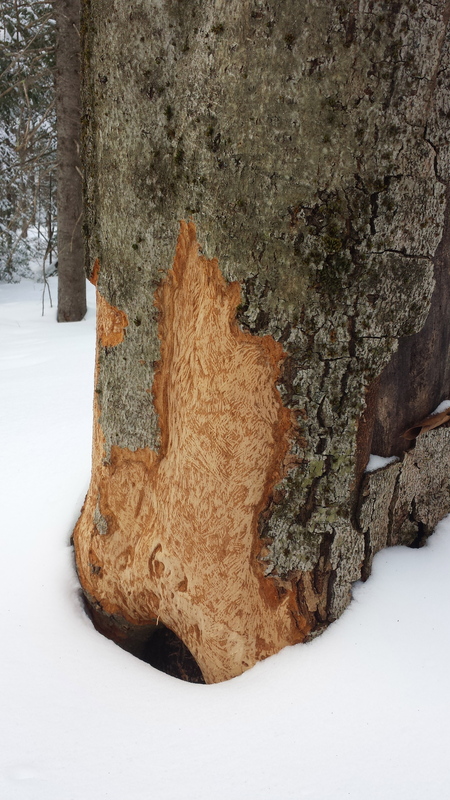 There are piles of logs and old stumps within all the enclosures they have inhabited (the panhandle field, as Jake calls it, is over five acres so there are plenty of new patches for the weekly moving of polywire fencing), and the turkeys delight in climbing, flapping their wings, sweeping back down to the ground. They have a covered roosting hutch, fresh water, and people who love hearing their constant murmuring sounds all day long. They are content turkeys. Also, smart. I have been wondering why turkeys have the reputation which I wrote about. These fellows are bronze turkeys, not white. A difference? Closer relatives of wild turkeys, which apparently Ben Franklin loved and wanted for our national bird instead of the eagle? 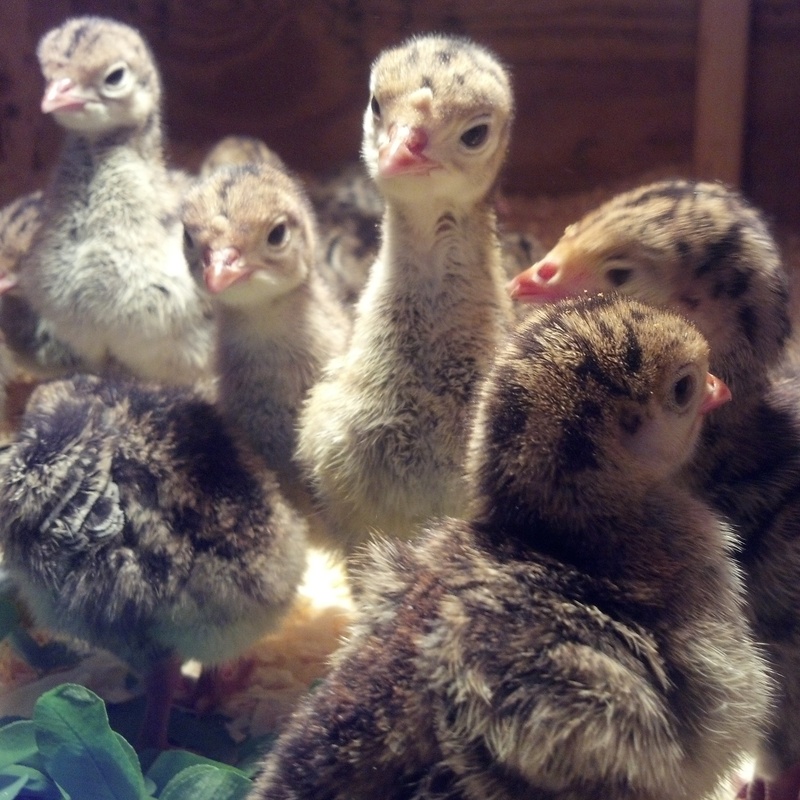 Yet, some of this initial batch of turkey poults died, too. Perhaps it is their frailty at an early age that earns them the reputation of “not too smart.” Whatever that may be, feeding the current batch of turkeys is my favorite job on the farm. They talk to me the whole way to the feed trays, trotting along behind, jostling each other a bit, but respectful, too, something that clearly would not be said about the chickens. 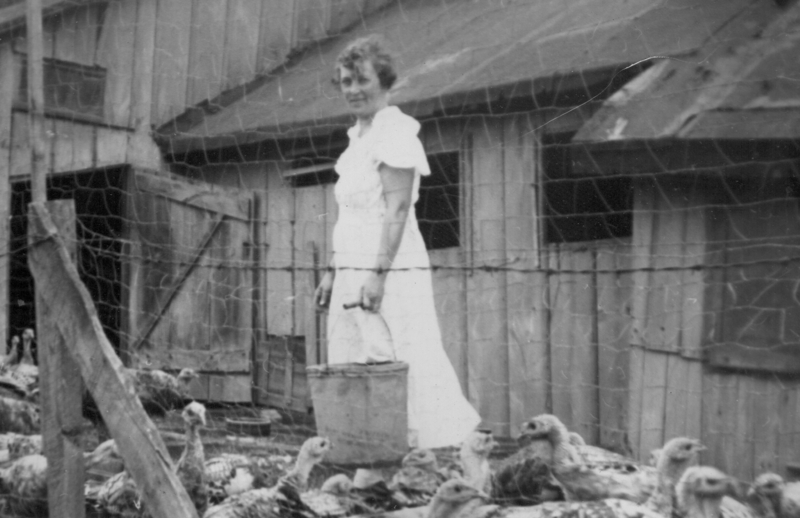 I have a photo of my grandmother, over 100 years ago, standing, in a white dress no less, with a grain bucket in her hand feeding her turkeys. If she could only see me now. Hatching day was May 21. Hatchet day should be November 26. It is just that we can’t all agree if we really want to eat A.T. Not that we are squeamish. It is more that A.T., short for Attack Turkey, has wormed her way into the family, gotten herself a turkey-toehold in our affections, so to speak. 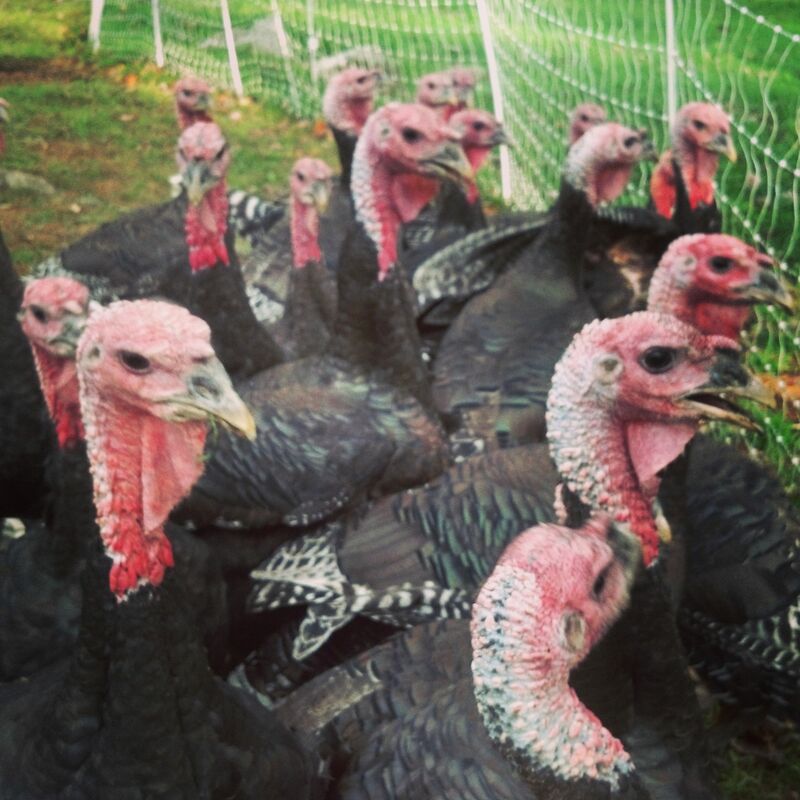 Last May, after we paid out a hard-earned $11.25 to the feed store, A.T. came to live with us along with three of her siblings, each of whom immediately demonstrated and confirmed all written instructions for raising turkeys. According to my homesteader’s handbook, “Turkey raising appeals to the least number of people… turkeys are the most difficult domestic fowl to raise… turkeys lay their eggs standing up… they are easily frightened… susceptible to disease… and are amazingly stupid,” or words to that effect. Cute though, at least at the beginning. When we stood each of the four turkeys in a corner of the box, isolated from the others, each held her position, facing the blank cardboard wall with an equally blank stare. They would have died there if we hadn’t herded them together again. The next night one did die — just lay down and called it quits. After a week, the three remaining turkeys, who were faring a little bit better with the world, were moved from their kitchen home to the large upstairs bathroom where we organized a daily TET. TET, Turkey Exercise Time, allotted 15 minutes of free-flying and romping on the bathroom’s vinyl floor. The poults were still much too tiny to be outside. Besides, turkeys catch every known disease from chickens so they couldn’t go anywhere near our barn. TET was a great hit until we noticed that two of the three turkeys each had a leg which would not stop twitching. Like miniature ballerinas, the little poults hopped on one leg while the other moved out from the body and back again, a turkey battement jete´. When the turkeys grew larger and we moved them to a pen outside my kitchen window, the condition worsened. Their weight ended their dancing careers, and the hatchet, sadly, ended their lives. Our investment of effort and money was beginning to look like a mistake. A.T., now worth the original price plus two bags of feed, didn’t seem to care, or even notice that she was alone. Why should she, when life under the old apple tree was good and relaxing? Best of all she considered herself a house pet with all the rights and privileges. Each day throughout the summer I would let A.T. out for a romp, a little like the old in-house TET, but now she was really free. I would find her walking into the kitchen when the door had been inadvertently left open, and, much to the frustration of the drivers in this family, she also left daily deposits on the hood of the truck or car. She took great delight in following me. My summer gardening days are filled with memories of a great white turkey standing next to me as I weeded or tootling along behind me for a walk in the woods. She had grown into a big animal with heavy, sleek, snow-white feathers and a head that didn’t look too bad for a turkey. In addition, I thought her brain had enlarged slightly, getting a bit smarter, until the day she went to the garden alone and “got lost” on the other side of the house. Her cries — a half gobble which was snorted through her nostrils — brought us all running to her rescue. As soon as she saw us, she ran happily with outstretched wings to the arms of her keepers. A.T. continued to cost us money as well. Feed disappeared at $6.08 per 50 pound bag, the most expensive medicated kind because otherwise turkeys develop blackhead, a horrid sounding disease. There were unseen costs, too. The day the tile-layer was working in our mud room (at $15 per hour labor cost), he disappeared. I found him supposedly cutting tiles but actually playing water-spray tag with A. T. in the front yard. More money down the old turkey tube. When September arrived and apples fell, A.T. found a new diversion. Casey, our golden retriever, who comes close to A.T. on the intelligence scale, eats apples. So does A.T. She especially likes the apples that Casey is eating. That is nothing really new. All summer A.T. ate dog food, the big hunky-chunky kind. 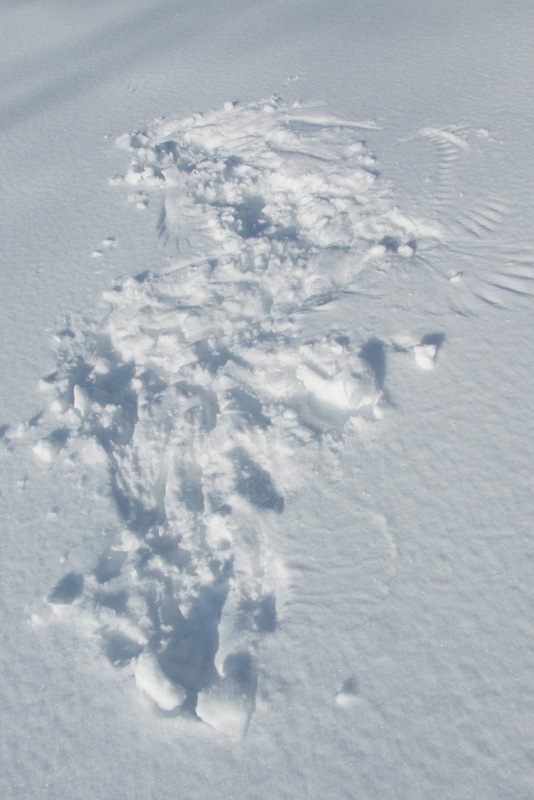 Casey, intimidated by strong wings and a fast beak, went hungry while A.T. strutted around with a bulging crop. Once again Casey was never given a moment of peace. Fifty apples might lie on the ground and one would be in Casey’s mouth — the one that A.T. wanted. She would sidle up to the poor dog, make a lightning fast jab at the apple, and Casey would be yelping and running for the house. Things haven’t changed one bit now that November is here, except that A.T. is plumper and better looking than ever. She still chases Casey. She calls to me every morning and actually seems to want me to pat her when she leans against my leg. Maybe she is smarter than I give her credit for. How unattached am I to this turkey now worth $6.50 per pound? Enough to eat her? Maybe I had better get busy and winterize her pen.